A Functional Behavior Assessment is a tool used to pinpoint why a certain behavior is occurring with a student. By finding out what is causing (triggering) the behavior, educators can utilize strategies to minimize or completely change the behavior in their buildings. This assessment form is to be used 1) after documented behaviors have occurred repeatedly and 2) previous interventions have been implemented to attempt a change in the behavior. 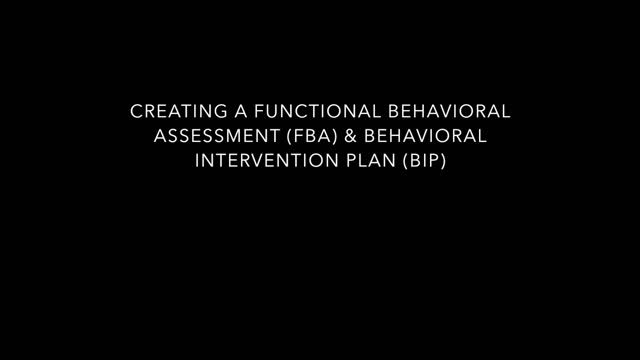 Once an FBA is completed, a BIP (Behavioral Intervention Plan) can be instituted for the student. With the knowledge and support as a group, educators can help manage the behaviors in their classrooms and buildings more efficiently, in return, providing more quality instruction to the students with limited interruptions. Further, this plan will help streamline the process and empower the teachers to be more confident in completing an FBA, and how to effectively manage behaviors in their classrooms. To access the FBA sample, template, and forms, click the FBA Tools Tab located below the main Functional Behavioral Assessment Tab. To access the BIP sample and template, click the BIP Tools Tab located below the main Functional Behavioral Assessment Tab. After watching the video above you will need to click here to complete a short survey.